Art is beguiling and enriching, taking us to a place where our imaginations can run free and our lives find new meaning. But what else can it do? Well, as a form of expression art is very powerful; as are all the creative disciplines. Take film and music, for instance. How many penny-drop moments have come to you during a poignant scene or after hearing a simple yet profound lyric? As Picasso once said, "Art washes from the soul the dust of everyday life." But there is also a third way in which art can be a force for good, and that's when it sparks renewal or rebirth, particularly in the physical world. 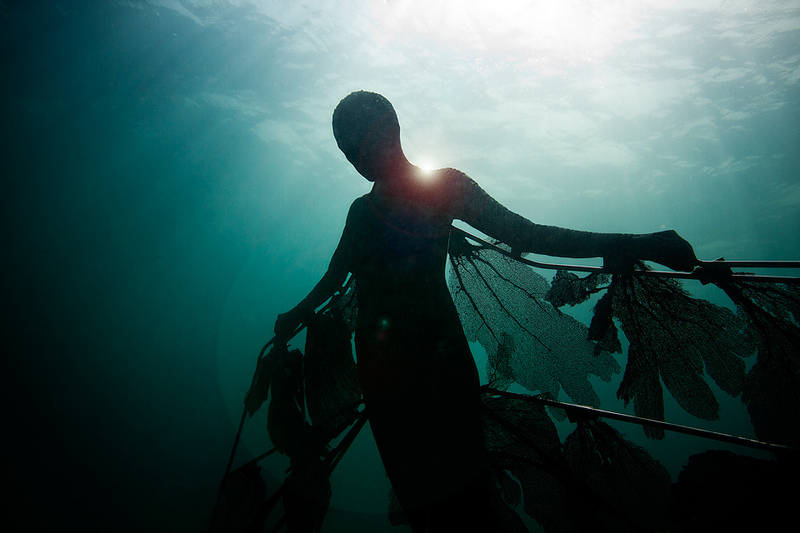 The best example of this is the work of underwater sculptor Jason deCaires Taylor. It's very likely that you have seen one of his installations in a magazine, newspaper or on a blog. Apart from our enduring fascination with the ocean and what lies beneath, there is something instantly striking and universal about what Taylor does. He has this great ability to weave history and folklore into beautiful large-scale works literally clothed by their underwater environment – specifically plants and coral. They are eerie and elegiac but there is also a sense of hope. Taylor uses pH-neutral cement and fibreglass to craft his sculptures, which form artificial reefs. These not only create new habitats for fish, coral and plants, they also draw tourists away from saturated diving spots and generate revenue to plough back into local conservation projects. On his website, we are told that, "Over the past few decades, we have lost over 40% of our natural coral reefs" and "scientists predict a permanent demise of 80% by 2050." Through his work he hopes to promote the regeneration of marine life and use sculpture to raise awareness of the plight of our oceans. From the Museo Subacuatico de Arte (MUSA) off the coast of Grenada – which comprises more than 500 figures – to his recent Ocean Atlas, an 18ft 60-tonne Bahamian girl appearing to carry the weight of the natural world on her shoulders in homage to the Greek Titan Atlas, his ghostly cast of characters in coats of many colours asks big questions about who we are and where we are going. In 2008 I met Jason at his studio in Wood Green, London, to interview him for Lexus magazine. The previous day he had appeared at a coral symposium, which explored how the arts and crafts communities, scientists and environmentalists could join forces to "save the world". Unfortunately the piece was not published but after hearing about Ocean Atlas and Angel Azul, a new documentary about the sculptor, I decided to dig out my warped tape and extract a few nuggets. "The water has always been a huge part of my life. When I was a kid I used to live in Malaysia. I would go the beach after school every day. I then moved to the Caribbean where I became a regular diver. For many years I've had incredible dreams about being underwater. My first instructor once told me how he’d go to these spectacular caves in Turkey. He would turn off his torch and feel his way out. He said it felt like being back in his mother’s womb. I can relate. You have a much more detached consciousness underwater – like a form of meditation. I tend to take off my mask and dive with nothing but a tank and regulator. You get that cold rush on your face and it’s amazing." "All those coral reefs I used to visit as child in Malaysia were once pristine underwater gardens teeming with fish. Now there’s barely 20 per cent of that left. They're mostly covered in brown algae. On top of this you have all the run-off from factories and farms. The El Niño effect has wiped out a colossal amount of coral over the past five years. What happens next? You can't cool down the temperature of the oceans by a few degrees just like that." "People will always be concerned with family and their immediate surroundings first and foremost. It's difficult to think of the planet on a global scale. The world is fed up with democracy where governments are re-elected only to carry on doing things that don't seem right. When your economy is tied into a capitalist venture its hard to break free. This has to change. For example, all new-builds should be self-sufficient and carbon neutral. I've just come back from Mexico and there's a whole strip of land covered with new hotels, each with its own big air-conditioning unit and sewage run-off. "I want my work to mirror our own lives. Nothing is ever static. My art follows the same line." "I try to transform the landscape into universal yet confrontational art that the wider public can appreciate. I like to work quickly and then step back rather than keep fiddling. My first glance is usually my best and most honest reaction to something. But working underwater there are a few more administrative hoops to jump through (regulations, emissions, funding) so that's not easy. As time as passed, my work has been less about allure or practicalities – i.e. how is this going to work underwater – and more about having a strong message." "The most exciting part for me is the unpredictably of the whole thing. How my work changes underwater due to the light, magnification…"
"I’m not a methodical person but I like to work visually and take lots of photographs. The shots are going to be much better the shallower you are. The deeper you go, the more yellow and red is absorbed, leaving a mass of deep blue and black." "I didn’t want to go over to the Caribbean as a colonial Brit artist and start trying to tell people about their own past. It just wouldn't be read in the right way. I did want to integrate some of the history of the Grenada into my work and seek funding. That meant working with the tourist board and local government, and ultimately compromising, which can make it difficult to preserve your integrity. I also had lots of help from the diving association and fisheries as well as volunteers from the local community college, who made casts of their own faces." "I've had to sell my house… Relationships can be difficult to maintain, living three months here and three months there. My whole life has been transient to some degree, and comes out in my work. Normality to me is moving on every year or so." "Mixing and lifting cement can be challenging. I once put my back out and couldn't work for months. That first week, in particular, was a nightmare." "I think it's got something to do with the history of time and how we place ourselves in the evolutionary scale. Many of us can't help but wonder why we are here. Underwater you are dealing with a completely different notion of time and it's confusing but fascinating; even for me when I return after a month and the work looks completely different." "I'm told that it's a very personal and individual experience for each visitor or tourist. And all the publicity is very encouraging because it shows that art can really transcend many different barriers." In the subject on artificial coral reefs I popped into Fabrica gallery over the weekend and saw the beginnings of artist Simon Faithfull's sunken ship project taking place off the coast of Dorset. "Over the next twelve months the Brioney Victoria will become colonised by marine flora and fauna. Through cameras on the boats we will be able to witness the metamorphosis into a new underwater ecosystem." Worth popping down to see. After 23 November the exhibition will move to FRAC Basse-Normandie, Caen, and Musee des Beaux Arts in Calais.